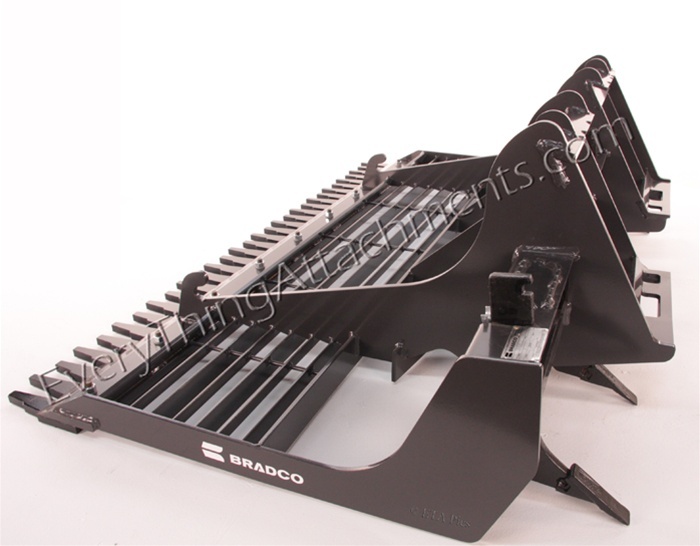 The Bradco 78 Land Sculptor is an extraordinarily versatile & practical attachment for skid-steer loaders & tractor Loaders with heavy duty beveled front cutter bar that provides extra strength and reduces wear. optional scarifier assembly digs in to break up hard packed dirt. 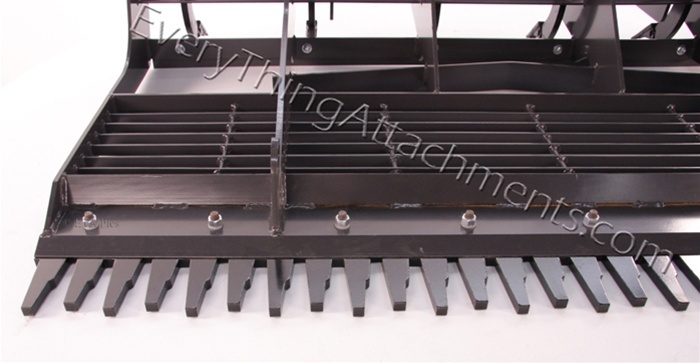 strategic placement of scarifier teeth permits ground engagement while in the retracted position. 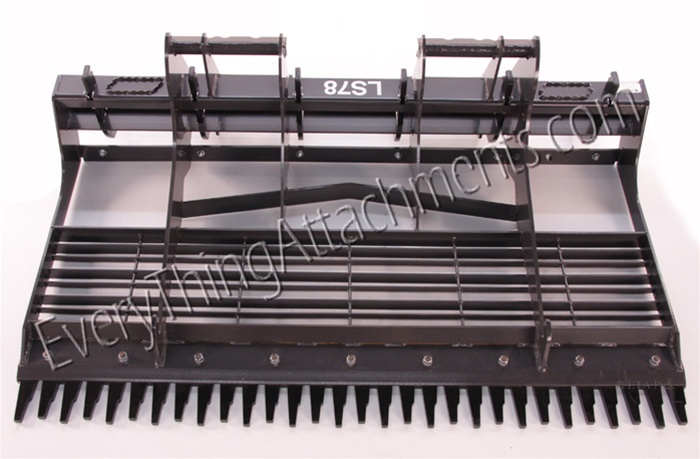 Includes Comb Assembly, Scarifier Tooth Assembly and Bolt-on Cutter Bar! 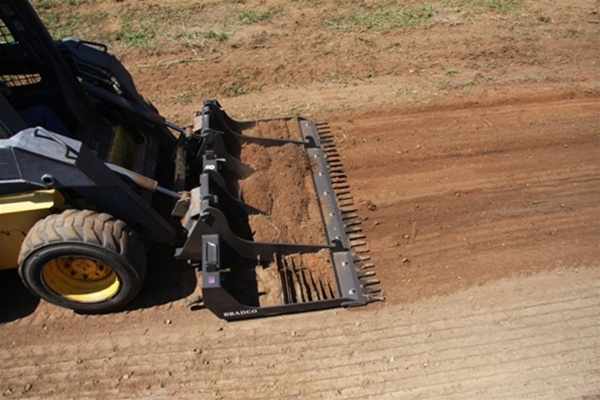 An extraordinarily versatile & practical attachment for skid-steer loaders & compact tractors. Free shipping within Continental US. Ted: Hi, I'm Ted from EverythingAttachments.com and I'm here to show you some of the features and what you can do with one of the Bradco land sculptors. I've never used one until the last couple of weeks around my house. I got this in and I looked at it a few times and I wasn't really sure exactly what to do with it or where I would use it. Since I've used it, I believe this is probably the most underrated tool I've ever used. We're going to take this bank, which is pretty rough, that we just cut off the side of here and just show you how you can just take this amazing tool and make a mess and make it look pretty in just a short amount of time. We've only been working with it about five or eight minutes here and already done an amazing amount of work. We're going to round this bank off here where you can actually mow it in just a few minutes, instead of a day with certain machines. Your machine's no better than the tool you put on it. You've got a big investment in a machine. You should have a land sculptor. It's a really amazing piece for landscaping. We took a bank, there was no way you could have mowed it or anything else and make it pretty good. In less than eight minutes here, we've done about a 60 foot area. It was about a three, four foot high bank,of this old red clay. It's still a little bit wet, which makes it actually a little harder to work, and gummy, but it broke right up. And as you can see, it doesn't look like much, but it sure does a lot. The end cone that's available for it is what makes this fine ground here similar to the Harley rake, so when you end up finished you could sow grass right after this. It's the best tool I've seen for the money. I'm here to point out the features of the Bradco land sculptor. This happens to be a 78 inch that we've got here. There are three options available for this particular machine. I believe in almost every case you need all of the options. I've used it. It's an amazing piece, but the pieces that we've added to it that are options just make the whole thing work like it should. It's got the cone -- it goes on the front -- which is a very hardened piece of cutting edge that's cut out so when you back drag on an angle, it really leaves a nice level look. Leaves it looking similar to a Harley rake has gone over it. You've got your cutting edge here, which is going to help you trim the dirt down in the high places. And then you've got your welded grate in here. Everything is placed strategically on an angle to keep the rocks from wedging in and so forth. The best way that I can describe this, that we've all come up with after seeing it work, is it works kind of like a cheese grater. It has an extremely high hitch on it here, allowing this to be about a half a foot under grade and still be level, so you can do your maximum grading. No matter how your land is varying, you're able to be able to keep your machine down on the ground because of this extra extended hitch here. It also helps you because this has the ripper feature on the back. 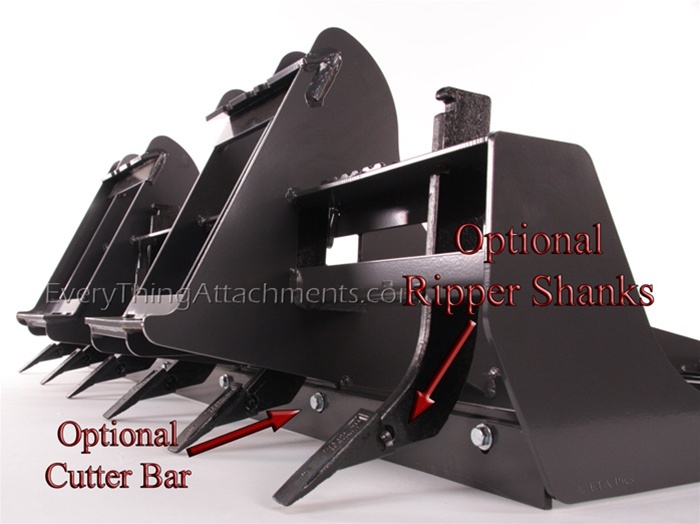 So the rippers and the back dragging plate here, that's adjustable. With this, you're able to roll your bucket. Like if this was a bucket, you would roll it up in the front. That's going to make these sink really deep in the back. These are in their lowest position for right now. But when you've got your land sculptor tilted up, then your rippers really sink deep into the ground and then you back up with it. Then this edge here just helps straighten and level everything out. It is adjustable, replaceable, and it just does an amazing job. It doesn't look like much more than a big grate here, but it's just amazing what it does on a skidsteer here, especially a track machine if you happen to have one of those. Then there's a couple of bars in here that are on different angles -- this bar right here -- similar to what they use to drag after a tractor pull has gone on to fill in the grooves. They used to angle a piece of steel to bring all the dirt back into the holes. It's just an amazing piece. It has the Ford's ripper teeth on it, replaceable points. It is adjustable right here by removing this one pin. It'll go up and down about three inches. You've got a good foot pad on both sides. This thing is just great. I haven't found anything that it wouldn't level out and make look like a Harley rake or even an expensive tool something like that had gone over it. 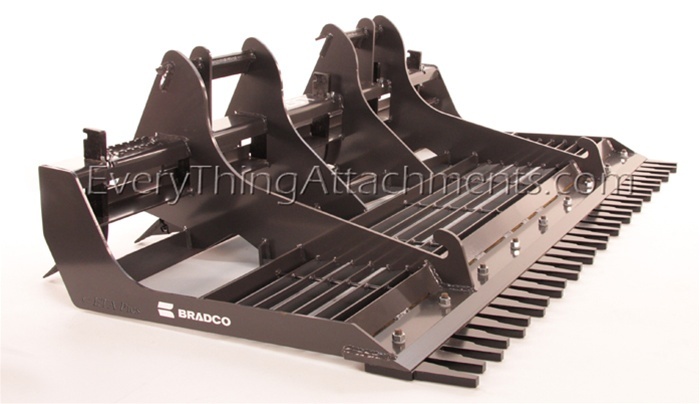 Hi, I'm Ted from Everything Attachments, and we're here today with the Bradco Land Sculptor. Now, when I got one of these a few years ago, I wasn't exactly sure what to do with it because I'd never seen an attachment quite like this, but since I've used it, this is probably one of the most underrated implements that I've seen and used. This has three different options that are optional on here, and I'm going to show you each of these options, and to me, using it the way I used it, all three options are very important. 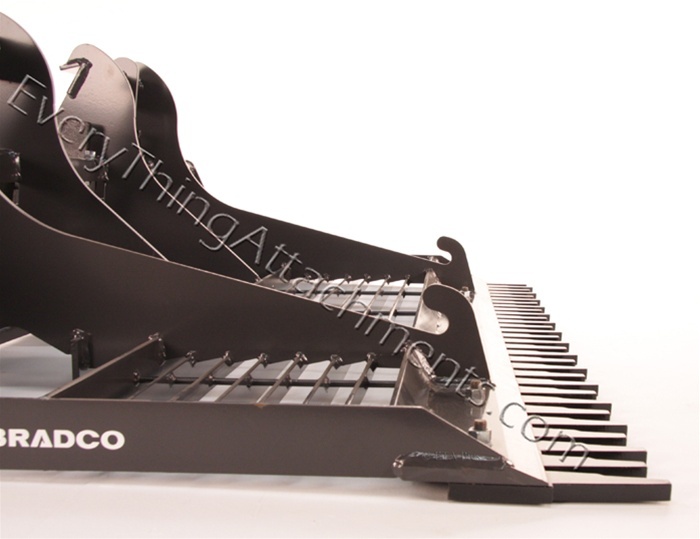 The first option is this comb on the front. It's three-quarters of an inch thick and it's kind of like... turn me back just a little bit, Peanut, where we can see the front of this comb. This piece is bolted to this 3/4 inch thick cutting edge. That's good. And what it does is, it allows you, when you get up on a hump, you've got a high spot, you can just simply... especially if you have a track machine or a large-tired skid steer... this only comes in a 78-inch width and it lets you take that comb and just kind of go back and forth and grind your way through the hill that you have in front of you. Even small rocks and stuff, it pulls them out. This does an amazing job to have that so, it doesn't look like it does a lot, but it's really important to have that. quarter inch thick cutting edge under here, so it's very heavy duty and it would work without the comb. And then, we'll show you some pictures looking down on this. It has like a grate system in here, and it kind of lets the loose stuff go through. It will keep the rocks and stuff in it. You can always go back after you've separated and pick up your rocks and dump it. Use it like a bucket. It has another piece of steel back here that's bent. It kind of keeps everything together and just lets it... it is a land sculptor and that's pretty much what it does. Turn me on around to the back, Kevin. It's got the option right here with the... it's got forged ripper shanks with forged replaceable teeth on it, and then it also has this strip of steel here that's optional. And that allows you to be able to tilt your bucket up, using the ripper sticking down far and back up and rip the ground, and then smooth it back over. It doesn't look exactly... you're not sure exactly what to do with it, but if you use this, I guarantee, you'll like it. These are adjustable. You can adjust these ripper further down. You can just simply back up, rip it, make your soil loose, go forwards, and because it has such a long length on it, it really gives you a good feel for what you're doing in keeping it level. And with this hitch plate, if you'll notice, it's way off the ground. It's really high up here and so that allows you to be able to put these rippers really deep in the ground and go over the sides of hills in back and just keep it sculpting. I used one of these probably 20 hours over at my house on six acres that I just landscaped, and this was the best tool that I had. So, if you give us a call or an email at Everything Attachments, we'll help make sure you get the options you want and make sure that your machine is right for this. 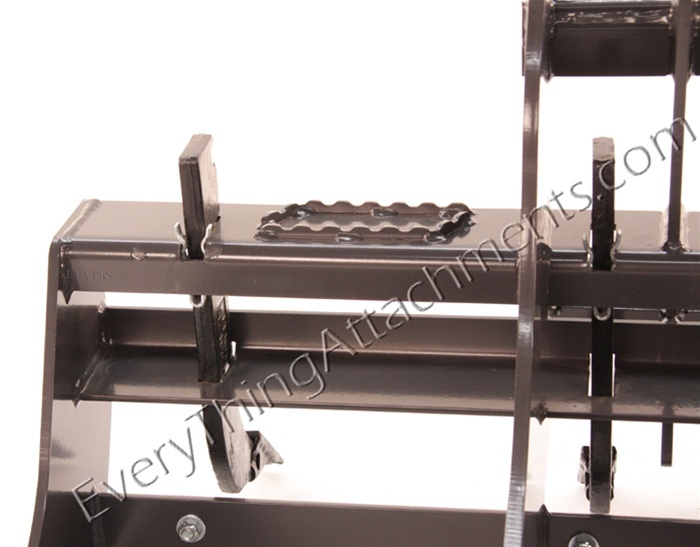 If you make all your purchases at Everything Attachments, we'll always give you the best customer service. 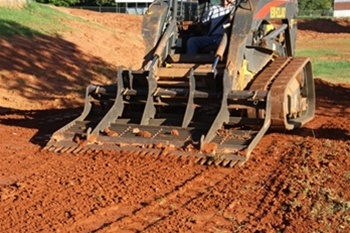 The Bradco 78 Land Sculptor is AWESOME. Build quality is top notch. I used the attachment shortly after I got it home and its so easy to make my gravel driveway perfectly level and uniform. Shipping was super fast and they have great customer service. I had it shipped to my local lumber yard where I do a lot of business and they offloaded it until I got there with my trailer.....super easy! The land sculptor has saved me hours on every job! It has become my favorite attachment. Worth every penny! I couldn't be happier with this implement. Great for scraping the driveway and spreading gravel or mulch. Cuts with ease. aptly named as it defines terrain without a thought. MUST HAVE!